Foxconn Technology Group, the Taiwanese firm that plans to build a $10 billion manufacturing plant in southeastern Wisconsin, will create a “technology hub” providing at least 150 high-tech jobs in Eau Claire, the company announced July 16.At an event featuring Gov. Scott Walker and company officials, Foxconn unveiled plans for what it dubbed Foxconn Place Chippewa Valley, which will be housed in two downtown properties. Foxconn will buy The Grand, a six-story office building at 204 E. Grand Ave, and will buy or lease 15,000 square feet of co-working space on the first floor of Haymarket Landing, 220 Eau Claire St. 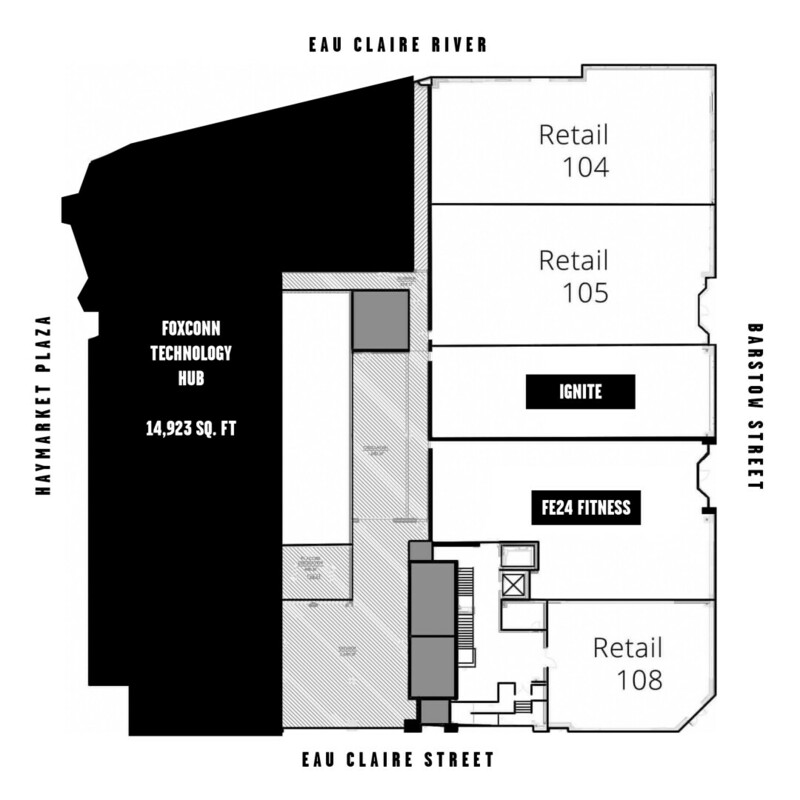 This represents just under half of the roughly 34,000 square feet of retail space on the first floor of the latter building, the upper stories of which are devoted to student housing. “Foxconn’s investment in the Chippewa Valley is great news for the region and the entire state as the company continues to demonstrate how its presence in Wisconsin will truly be transformational.” Mark Hogan, CEO, Wisconsin Economic Development Corp. The Grand, formerly a Wells Fargo Bank, will be used to house a laboratory for technological solutions, while the Haymarket Landing space – which will overlook Eau Claire Street and Haymarket Plaza – will be used “as an innovation center that will be part of a talent and innovation network,” Foxconn said in a press release. Foxconn and Commonweal Development began discussion of the technology corporation’s temporary occupation of Haymarket Landing in June, according to Commonweal President Stuart Schaefer. Further discussions will determine whether Foxconn will purchase or lease the space. The move to invest in the Chippewa Valley is part of a multibillion-dollar project to establish a Foxconn production facility that is expected to make LCD screens in the Racine County village of Mount Pleasant. Walker, a Republican seeking a third term as governor in November, promised the company up to $4.5 billion in tax incentives to build the $10 billion factory and create a predicted 13,000 jobs in the state. The tax incentives – which are believed to the largest ever offered by a state to a foreign-based company – are based upon job-creation and investment targets, the Associated Press has reported. 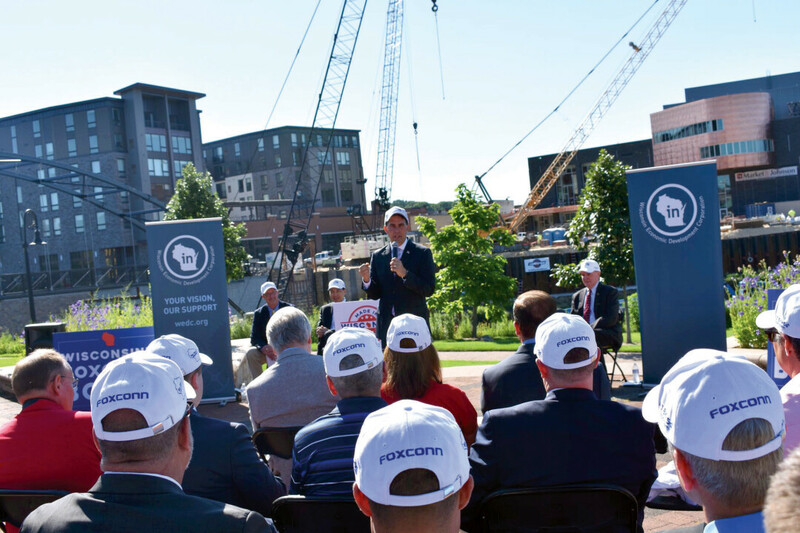 Foxconn had previously announced a similar innovation center in Green Bay as well as the purchase of an office building in Milwaukee. Since it was first announced last year, Walker’s Foxconn deal has drawn both praise and criticism from public officials and citizens. Among other things, critics has questioned the Foxconn plant’s environmental impact and have argued that the payoff to Wisconsin and its residents will be too little for such a large benefit to Foxconn. Protesters waved signs that read “No Foxconn, No Walker,” at the July 16 announcement in Phoenix Park. Andrew Werthmann, acting president of the Eau Claire City Council, said in an interview that he had reservations about Foxconn. Foxconn plans to close on these properties later this year and open the spaces for operation in 2019.